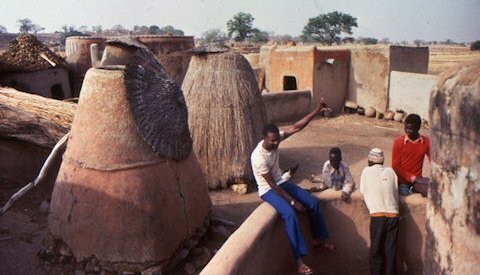 A short visit to a village in Burkina Faso will explain why. The round houses sit inside a boundary wall of mud, straw, small rocks and sometimes animal dung. The entry is an opening without a gate or door, although the residents may block it at night with tree trunks or pieces of wood. This is where all visitors stop. Knock all you want, there is nothing here that will make a sound that will carry. If you knock on the mud wall you will get scraped knuckles, but no sound. Calling out “Ko, ko, ko”, on the other hand, makes a lot of sense. When our two sons were 1 and 3, we took them out of Burkina Faso, the only place they had known, to the US with a stop to visit friends in Switzerland. It was January, so on our first day in Switzerland our boys got to know snow for the first time. Then I went for a walk with our older son around the small town. I realized how much they had adopted the culture of Burkina Faso when our oldest walked up to the door of a Swiss store, stopped and called, “Ko, ko, ko.” I had to tell him that the Swiss have a different way of life, and that they just walk through doorways of stores without calling. No one is listening for them. In Burkina Faso, we learned that there is a specific kind of person who knocks on doors. That is the thief checking to see if anyone is home. So, how might you translate Revelation 3:20 into a language of Burkina Faso? If you translate it word for word, what will people understand about Jesus? This entry was posted in Heart language and tagged Burkina Faso, Ghana, knock, knock on door, knocking. Bookmark the permalink. You may be on to a linguistic universal! Wow, Ed, this is a interesting situation concerning Jesus knocking on the door. Your topic are always insightful and thoughtful for me and I am especially glad you put in the time to understand each people’s group heart language so as not to muff something so important in knowing God. I loved the pictures of the houses. Thank you. I usually do not reply but I always rejoice when I see one of your emails. So, how do they answer? Is it equivalent of “Whose there?”?